As winter rolls ever closer it is sometimes nice to forget about the cold days, the wet days, and remember the warm summer nights. 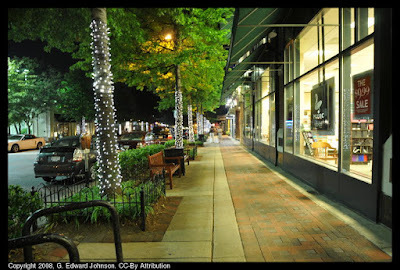 An evening stroll along Bethesda Avenue makes my list of things I am thankful for. This picture is from July, outside the Barnes & Noble book store. Photo by G. Edward Johnson. I went for a walk on the Sligo Creek trail in Silver Spring, MD and saw a sign from our friends at "Friends of Sligo Creek" letting me know that American Eels live in Sligo Creek. I really had no idea. (I didn't even know that there were freshwater eels, let alone living in Maryland, let alone living this close to me.) They breed in the Sargasso sea but spend most of their life here. Another interesting tidbit is that Maryland produces the largest harvest of eels of all the states. I also learned that posting advertising on trails by creeks is an effective way of reaching people like me. I didn't actually go there to look at the flyer, I went for the walk and to generally check it out, I've never been there before. 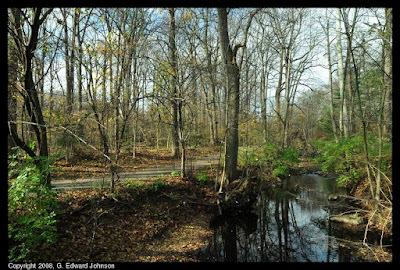 Sligo creek is fairly narrow, one side of it has Sligo Creek Parkway and the other side has the trail. The park itself is pretty narrow so you can almost always see both the road and the houses along the side of the park. Along the trail there are numerous small playgrounds for the surrounding neighborhoods. This time of year most, but not quite all, of the leaves are off the trees and the paved trail was covered with a layer of leaves. There were a reasonable number of people on the trail (it was a weekday morning after all, why weren't they at work). A mix of joggers, walkers, and people pushing strollers. Congratulations Bethesda, MD (and the rest of the Bethesda-Gaithersburg-Fredrick statistical area) the CDC ranked you the 30th healthiest place to live in the US. Handily beating out Northern Virginia, which came in at 41. 30th doesn't sound so bad when the list has 184 entries, putting Bethesda comfortably in the top 20%. From there, things get a bit more confusing. It is supposedly based on 2007 data, but the study that is linked by several news outlets is for 2006. "Surveillance of Certain Health Behaviors and Conditions Among States and Selected Local Areas --- Behavioral Risk Factor Surveillance System (BRFSS), United States, 2006" That's a mouthful. Further, the CDC says "A news outlet recently conducted an analysis of CDC′s Behavioral Risk Factor Surveillance System (BRFSS) 2006 data, released August 2008. The outlet ranked some cities healthiest vs. unhealthiest, but CDC does not rank cities." Other news articles reference a particular part of the BRFSS the Selected Metropolitan/Micropolitan Area Risk Trends (SMART) database. It doesn't explicitly rank them, but I guess you could get a decent ranking if you put the time into it. It also has 2007 data, so I bet that is the true source of the report. It has all sorts of nuggets of information, for instance, 10.5% of the people here are binge drinkers, 34.3% are overweight and 18.1% are obese, even though 31% consumed 5 or more fruits and vegetables a day. 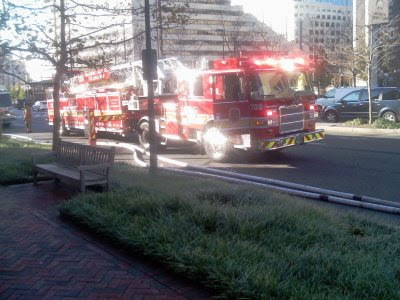 This morning the fire trucks came to the Chevy Chase bank building on the corner of East-West highway and Wisconsin Avenue (Route MD-355) in Bethesda, MD. They closed off two northbound lanes on 355 (out of 3) and two westbout lanes on East-West (again, out of 3). That really causes traffic problems. I didn't see anything obviously wrong although they did have the hoses out and connected to the buildings standpipe. As I am writing this, they are packing up the hoses and getting ready to go home, so lanes should re-open soon. I didn't see anything on the WTOP traffic page about it but it was the lead story on the traffic report I heard. I saw this article on the WTOP web site. There are a number of places that will give you free food today if you vote including California Tortilla, Krispy Kreme, Starbucks, and Ben & Jerry's. It's neat, and patriotic, but it really is to get you to go into their store, not to get you to vote. I can't even imagine someone saying "I wasn't going to bother voting, but since I could get a free donut, I did."